Backed by highly enthusiastic teams, we are involved in offering qualitative array of Wire Wheel Brushes at market leading rates. Our professionals make use of top-notch quality material for designing these brushes as per the international quality standards. Offered brushes are widely used for cleaning floors at various places. Deburring with brushrolls burrmaster rb 70 by matharoo & matharoo inc. Brand: MATHAROO & MATHAROO INC. Solve many deburring, edge radiusing, grinding and finishing problems. Their compliancy and filament nature accommodate part contours, prevent damage to value-added components, and make them ideal for robotic, semi and fully automated workstations. • Standard diameters are 60, 80, 100, 115, 125, 150, 180, 200, 250, 300. Custom sizes and shapes possible. Our customers can avail from us superior quality Wheel Brushes. 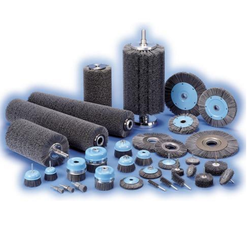 These Wheel Brush are procured from most trusted and reputed companies that are always preferred to supply flawless and standard products. These products are available in market at most economical rates.